Foam pits are a great draw for kids. But they are dirty, smelly and problematic. Some clubs only rarely allow Rec kids into the competitive pit, for safety reasons. Filled with our world famous Covered Rounders™, the pit system is made with a 100% foam core that will not break down, delaminate, or soften over time and a 21oz knife coated vinyl with built-in bacterial inhibitor. The UCS exclusive vinyl is Phthalate Free and Fire Retardant complying with CA Bulliten-117. As in all UCS gymnastics equipment, the included mats and 4 walls are sewn with 207 high tenacity thread providing years of rugged use. 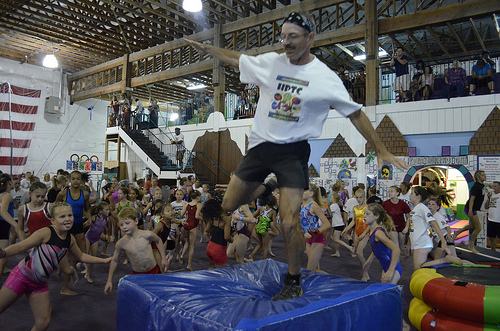 The pit is meant for recreational and pre-school use only. This product is not suitable for competition, training or action sports activities. This Pit is Rec only. Today I jumped into a Rounders pit for the first time. And was impressed.